Who today can honestly say that they never feel stressed with the modern pace of living? We live in an age of information-overload and most of us barely have time to catch our breath before moving onto the next project, therefore it is understandable that we suffer from headaches, migraines, irritability, etc. As a therapist you are likely to see more clients for stress and anxiety than anything else and will need a selection of different approaches in order to help them deal with this. 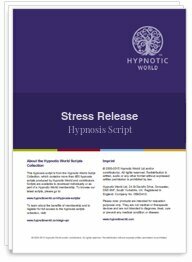 This Stress Release hypnosis script is based upon a forest visualization which most of us will feel at peace in. After all, how easy it is to be at one with the natural environment; trees that have been standing for hundreds of years and weathered the storms, the animals and birds of the forest. The script is complete with its own induction, deepener and stress release session to help your clients feel as though they have experienced a mini-holiday.